This is the front door of Bettina Schinas' house, opposite. Ag. Giorgios. The door was imported from Trieste, probably just after 1830 -- apparently all the best new houses had doors from Trieste. Bettina and her husband Konstantinos rented the house from Andreas Miaoulis for 1834-35, before they moved to Athens with the Bavarian court. 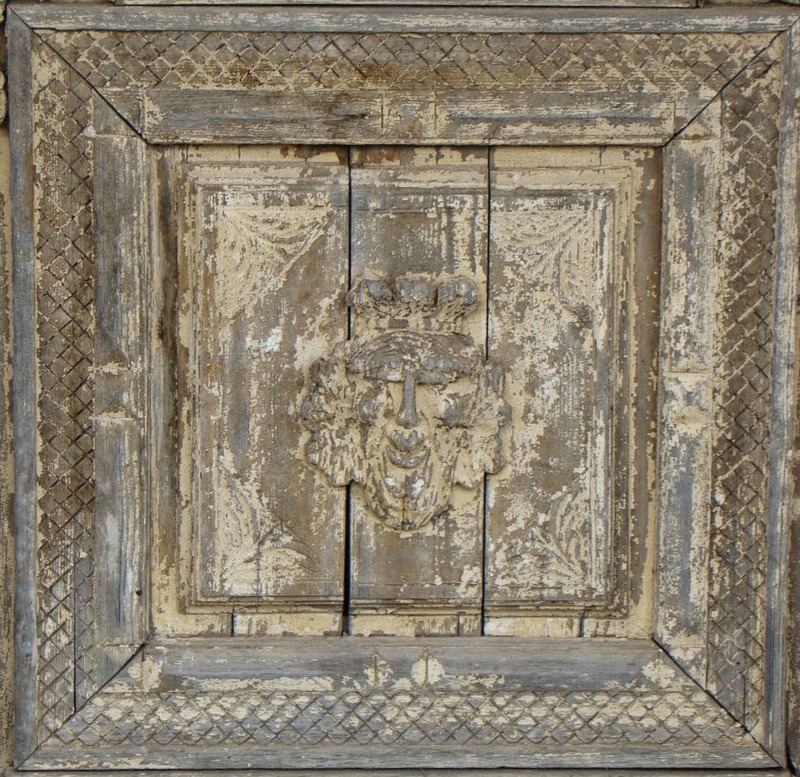 It is a splendidly carved door. Another view of Bettina's house. This deterioration cannot be blamed on the economic crisis. It takes a long time for a house like this to disintegrate. But this house is a significant element in Nauplion's heritage, and it is a disappointment and a shame that no one seems to find it important. Bettina wrote wonderful letters to her family from this house, describing Nauplion and the people she met --Kolettis, Miaoulis, Petro-Bey Mavromichaelis -- and later wrote wonderful letters about Athens. Brigitte Eckert made extensive translations from the letters so Surprised by Time could publish them. If you stand facing the bus station, and take the first corner to your right, you will come almost immediately to the door with these elegant lion heads (there is a small cafe). Below the lion heads are panels of exceptional carving – swags of leaves and little monster heads on either side of a shell, and then below that, a deeply-inset panel with the head of a Bavarian Green Man. The condition of this door has been developing for a long time: it is not a casualty of the economic crisis. But the disregard of Nauplion for such an exceptional work of art is another example of the carelessness demonstrated, for example, towards the Venetian staircase and gate to Akro-Nauplion. I would imagine that there is a lot of experience in Bavaria where preservation and restoration of wood carvings are concerned, and some of the ill feelings of the economic crisis might well be relieved by a Bavarian mission to help restore this shared heritage. The grandest of the surviving Bavarian houses is just up the street if you take the first left when you are facing the bus station. Here a classical-style Bavarian door has been built accommodated to the contemporary Greek stonework. The house belonged to the Count von Armansperg, First Minister to the King. This was the first house in Nauplion to have a piano. Bettina wrote about going to a party there. "I must report about the evening at the Armanspergs. Beautiful rooms nicely decorated, filled with all kinds of people, diplomats, officers, dressed in Bavarian uniforms, as palikaria or French; also the ladies dressed French or Greek. The countess in mourning because of the Duke von Altenburg’s death. She received me very kindly, complaining there would be no dancing because of the death. The daughters very pretty, very modest and polite, offered me conversation as they noticed I didn’t know anybody. The older played the piano later very skillful. The many rooms were crowded -- tea, ice cream, lemonades were offered. When the Countess saw me speaking with Kolettis, (I was standing up because he is so tall) she came and offered us 2 chairs next to each other so we could speak seated; the daughter played the piano, so we stopped our conversation." 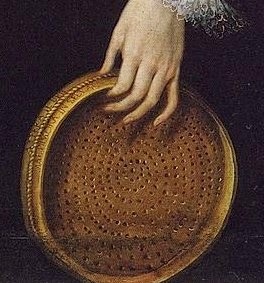 Elizabeth I, the “sieve” portrait. 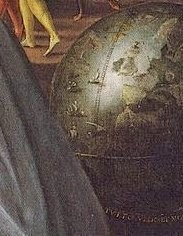 Quentin Metsys the Younger, 1583. I have become addicted to Wolf Hall, the novels and the TV production, so I have been finding Tudor portraits as a way of filling up the gap until the next book. 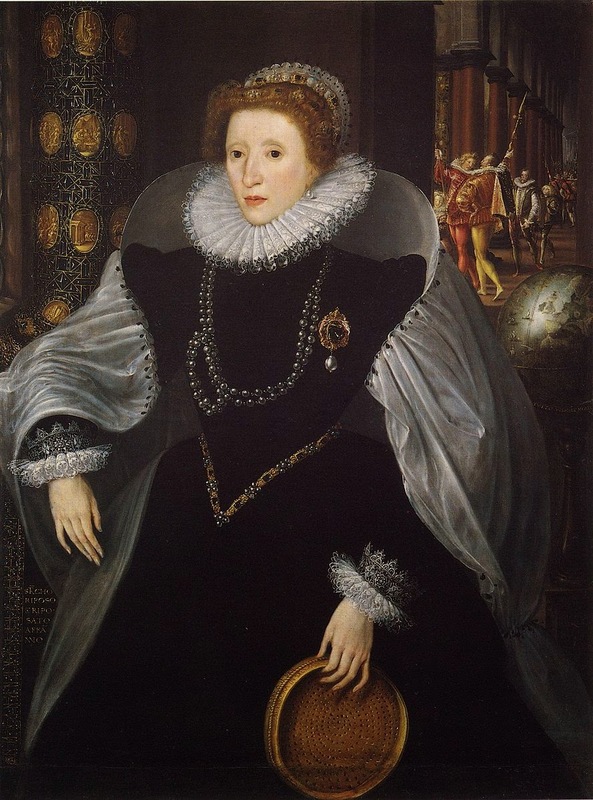 The finest of all the Elizabeth portraits is, I think, this one known as the “sieve” portrait. It incorporates two Elizabethan themes: Empress of the Seas, and Virgin Queen. Her position as Virgin Queen is shown as a representation of the Vestal Virgin, Tuccia, who carried a sieve of water from the Tiber to the Temple of Vesta to prove her chastity. The translucence of the flowing water shown at the bottom of the sieve is echoed in the astoundingly beautiful translucent sea-green globe. The themes of virginity and empire are brought together in the medallions on the column in back, although with some literary freedom, in the story of Aeneas who foreswore marriage in order to found an empire. The column is continued by the columns behind Elizabeth and the colors appear again on the courtiers on whom she has turned her back. 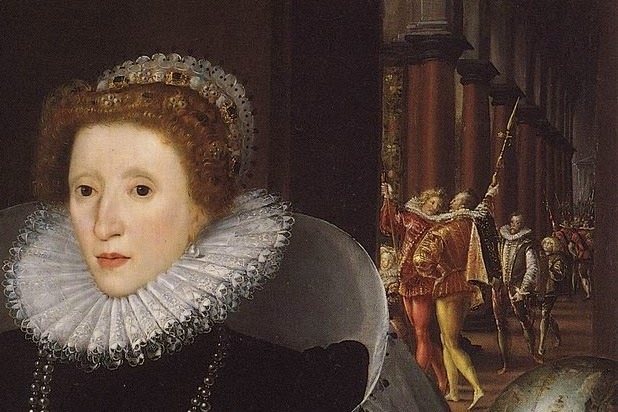 The patron of this portrait is thought to be her close companion, Sir Christopher Hatton, who may be the third of the background men. He is accompanied by a page who wears a white hind, Hatton's emblem. Pepagomenos was a doctor specializing in gout. We do not have an absolute statement that he was Cleofe's doctor, but there is enough evidence to allow us to deduce it. For example, in his monody he said, “There is need for all of us, and for myself especially, to let our voices loose in the intensity of our suffering.” I read that as a comment on his sense of involvement in, if not responsibility for her death. 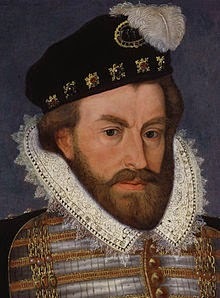 Later he spoke of “the body of our holy queen, so well-formed, so harmonious as to bring future happiness to the race.” As the daughter of an obstetrician, I read that as saying her body was suited for child-bearing, and so something he would be the only man, other than her husband, in a position to know. But when Cleofe died at noon on Good Friday, she had been fasting for nearly forty days, and there is strong evidence to suggest that she would have followed the most severe fast. She spent nights standing in prayer. She had, unintentionally, prepared her body for a massive hemorrhage. Pepagomenos called it a cataclysm, a deluge over the whole race – ἄλλον τινὰ καταχλυσμὸν τοῦ γένους παντὸς, and said it had come on suddenly. Bessarion also refers to blood, saying that her husband (like Zeus) had wept tears of blood (and, like Zeus, at the loss of a son in addition to his wife). “All the best for us came,” he said to her – sometimes he spoke to the assembled mourners, and sometimes to Cleofe – “with your settling among us. . . . But now everything goes the other way.” He mentions first her husband, “our holy ruler,” and then “her dear daughter . . . all her blood relations, her servants and cities.” Pepagomenos speaks of her daughter three different times, and then again of the loss to her subjects. He becomes more specific about her subjects: “But the bellies of the poor mourn especially the hands of our queen, which worked as it were to one purpose throughout her life, to nourish those in want, not merely through instruction, and through those of others', as might have been expected of such a queen, but themselves performing the service of cookery, collecting wood from wherever they had to, and lighting the fire, even roasting the food of the poor over it and serving it to them, nourishing them daily, taking no account of the heat of the fire, the intense burden of the smoke, and the inescapable duration of this service. This is an exceptional description. It was conventional for Renaissance and Byzantine ladies of good families to feed the poor, but nowhere, I think, do we learn that they carried firewood and cooked in the smoke. Though I do wonder where she had learned to cook. All the speakers spoke of Cleofe's character: Pepagomenos spoke more than the others of what she actually did in her life. It is possible that Pepagomenos himself knew the pain of losing a wife. 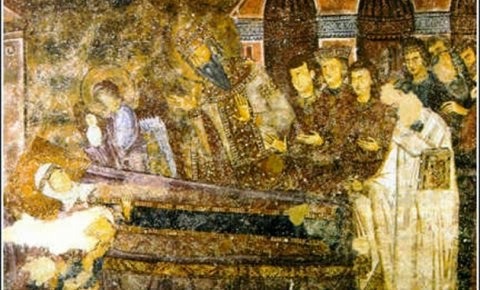 The cleaving of the one flesh that is a marriage was an easy topos for the Byzantines, but he went further: “The cleaving apart of a bodily union brings the unbearable pain of an amputation when a mother dies in childbirth. This, more than anything else makes the pain of the cut intense and presents the suffering as ever new in the eyes of the husband, and becomes an inexhaustible fuel for the fire, always displaying the newness of the loss, and never ceasing. But the severing of spiritual attachment has an intense bite and makes the pain even more unbearable, inasmuch as it is carried on in the the present life, while the former pain, although it is, so to speak, undying, continues to be associated with that material, though now lost, companionship. “This was not a good thing, and not how it should have been. Οὐ καλῶς μὲν οὐδ’ ὡς ἐχρῆν γέγονε δ’ οὖν. This is astounding: he has put Cleofe in the position of the Panagia, and has given her the nod – and so the authority – of Zeus. 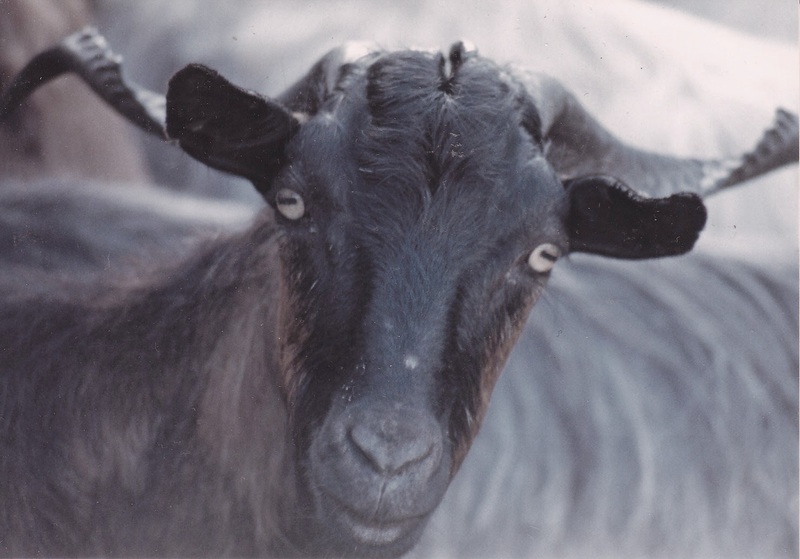 Basilissa of the Tsavelas herd, Karitena, 1987. He must cast lots over the two goats, one to be for the Lord and the other for Azazel. He must present the goat on which the lot for the Lord has fallen and deal with it as a purification-offering; but the goat on which the lot for Azazel has fallen is to be made to stand alive before the Lord for expiation to be made over it, before it is driven away into the wilderness to Azazel. Lev. 16: 8-10. “Azazel” is variously translated as “precipice” or “scapegoat”. The LXX translates it as tragos apopomaion or “goat sent out.” Some Jewish teachings regard Azazel as a demon of the wilderness. I am not going to get into Jewish or Christian theology here, or the scapegoat in various cultures. I have no religious point to make. I want to look at the Biblical pattern that presents variations on the theme of the pairing of sacrifice/altar and wilderness. Genesis 4 gives the story of Cain and Abel, brothers, a story in which the original killer – Abel who sacrifices on an altar -- is slain, and Cain is to wander. But Cain is to be protected. Seven-fold vengeance will be exacted from anyone harming Cain. Genesis 21 gives another story of brothers, Ishmael and Isaac. This story has more characters, is more complex, as you would expect from a story with women. Ishmael is sent out with his mother to wander in the wilderness. Isaac is to be sacrificed. Both are saved by angels. Then there is Jesus who is killed – the Gospels vary in their interpretation of sacrifice, and Judas who goes out to die. Matthew 27 and Acts 1 give slightly different accounts of the death of Judas, but they both involve a field, and hanging. In all four Gospels and Acts, the Day of Atonement is involved in the narratives, which brings us back to Leviticus where both goats presumably die. All the narratives bring Jesus back to life, but the original ending of the oldest, Mark, ends in fear. What does this pairing of altar/sacrifice and wilderness mean?